Last week we discussed Greg Utsinger’s Weekend Brunch Tips. We’re capping off this week with some last minute brunch recipes for anyone looking to make a last minute ‘wow’ with their guests. Cook bacon in 2 batches in a 12-inch heavy skillet over moderate heat, turning over once, until bacon is lightly browned on edges but still flexible, 5 to 6 minutes total per batch. Transfer bacon as cooked to paper towels to drain. Pour off fat from skillet and arrange bacon in skillet in 1 layer. Sprinkle Demerara sugar over bacon and cook over low heat, turning occasionally with tongs, until sugar is dissolved, caramelized (sugar melts very slowly and burns easily; reduce heat if necessary after sugar begins to caramelize), and coats bacon, 8 to 10 minutes. (Bacon will be dark and look lacquered.) Transfer bacon with tongs to brown paper to cool. In a bowl, whisk together eggs, milk, cream, rum, vanilla, nutmeg and salt. Spread bread out in 1 layer on a large rimmed baking sheet (about 11 by 17 inches). Pour custard over bread, cover with plastic wrap, and let soak in the refrigerator for at least 4 hours or preferably overnight. Flip bread slices over once while they soak. This can be halfway through the soaking, or about an hour before baking, whichever is more convenient. Heat oven to 375 degrees. In a medium bowl, whisk together brown sugar and butter. Pour mixture onto another large rimmed baking sheet, using a spatula if necessary to spread into an even layer. 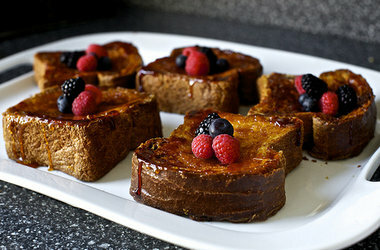 Serve immediately while still hot, with the crunchy brown sugar side up, spooning more of pan syrup over the top. In a small bowl, stir together the oil (or melted butter), and maple syrup. Pour this mixture over the dry ingredients and toss together, making sure all the dry ingredients are coated with the liquid. Spread onto the prepared baking sheet and bake for about 30 -45 minutes or until golden brown, stirring occasionally so the mixture browns evenly. (The browner the granola gets (without burning) the crunchier the granola will be.) Place on a wire rack to cool. You will notice that the granola may still be sticky when it is removed from the oven but it will become crisp and dry as it cools. Make sure to break up any large clumps of granola while the mixture is still warm. Once the granola has completely cooled, store in an airtight container or plastic bag in the refrigerator. It will keep for several weeks.